This recipe is rather easy to follow, but just as scrumptious! We begin by boiling our goat parts for about an hour (note: if not tender after an hour, let it boil for another 30 mins). In a deep-fryer we stir-fry our onion and add salt and pepper. After the onion browns a bit, add the cooked goat parts and then also let these brown as well. At the same time, we sprinkle a little more salt and pepper and add our cherry tomatoes, some of the goat broth, a pinch of cinnamon and a teaspoon of sugar. Next, we let the sauce thicken and settle a bit, allowing the broth to be saturated by the meat. Remove from heat. That’s it! 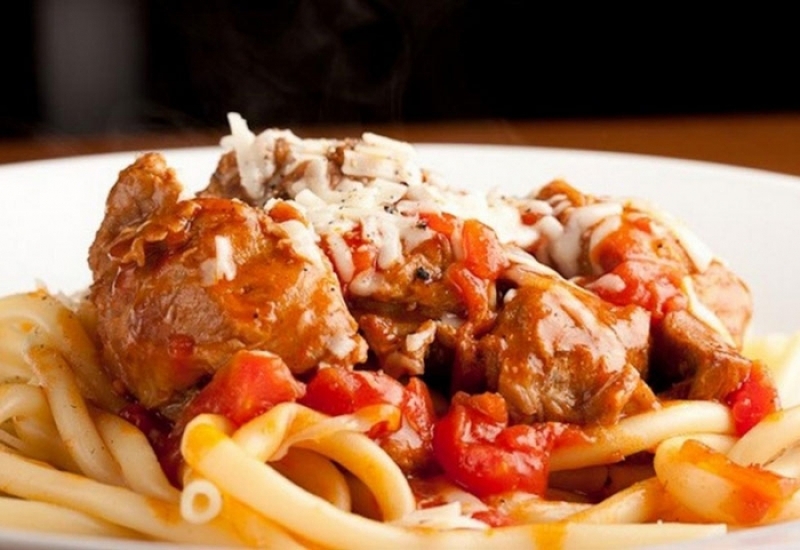 Fast and easy, our goat in red sauce entrée is finished and ready for serving!